Knowing where you are at all times and the progress you are making are crucial to the growth of your business, and in the building of your day-to-day confidence. 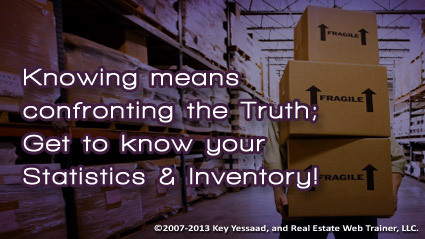 Know your Real Estate Inventory and know your Buyers’ Leads. If you create a way to visualize where you are right now, you will be able to do something about it; many of you continue to misuse your brain and rely on it for information storage, and when you are asked how many listings do you currently have, many make up a number that is close enough – this way of being is hurting you and you are not even aware of it. Know your numbers exactly, and create a visual representation of them that you will confront daily. In this blog I will focus on your listings: Get yourself a small writing board or print a large excel spreadsheet that forces you to look at your listings – it should include addresses; Listing#; current price; and Date listed; and anything else you deem important. Confronting your inventory daily and knowing the stages of progress will force to know when it is time to prospect (Hint: it is daily…) But it also will force you to confront the most important conversation with your Sellers – Pricing Strategy. Bring some sunshine to your business model and you will create opportunity and diligence!